Trade Minister Steve Ciobo was glowing at the efforts of Australia’s ambassador to the US, Joe Hockey. The latter, he claimed, had been prancing before the National Governors’ Association in an effort to focus interest on Washington’s antipodean satrap. At the press conference of February 24 for the two leaders, President Donald Trump did a bit of buttering up. Trump, however, was on form. As he does so often, he personalised the political. 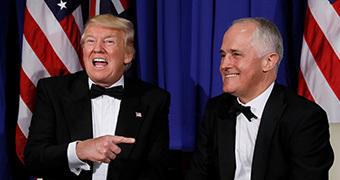 At the press gathering were Australians Greg Norman and billionaire Anthony Pratt, both of whom were asked to stand up by the president. The latter was singled out for his $2 billion investment in box making factories in the US. Trump had other offerings. The Imperial Chief was proving generous.